Replaced by the SND1000 – Sound Phidget. The 1133 measures sound pressure level from 50dB to 100dB. 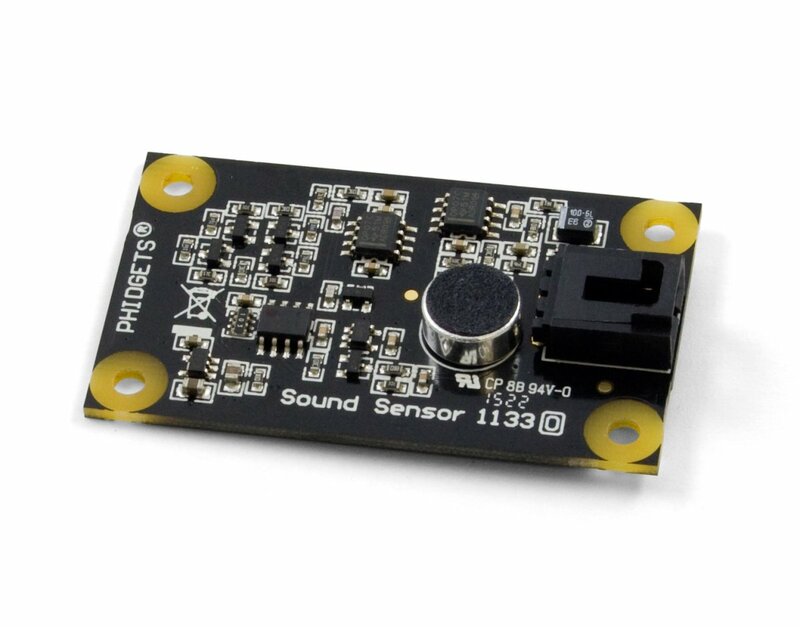 This sensor is tuned to measure in the frequency range 100Hz to 8kHz. 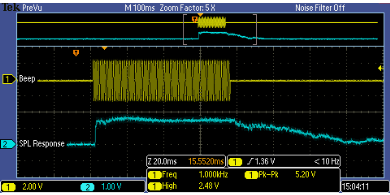 Outside this range the sensor's bandpass filter will drastically reduce the impact on the measured quantity. 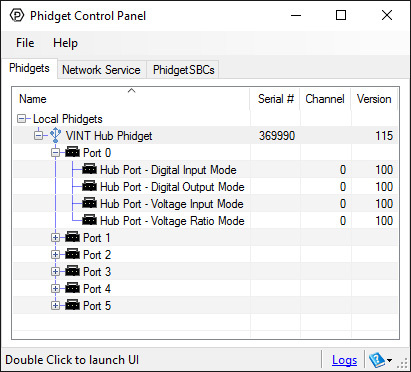 Connect the 1133 to the HUB0000 with the Phidget cable. Now that you have everything together, let's start using the 1133! 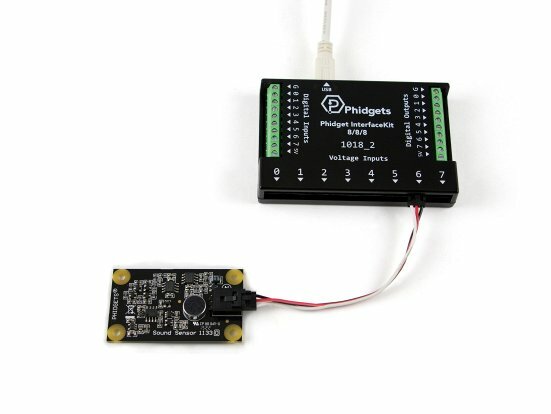 In order to demonstrate the functionality of the 1133, we will connect it to the HUB0000, and then run an example using the Phidget Control Panel on a Windows machine. Linux users can follow the getting started with Linux guide and continue reading here for more information about the 1133. 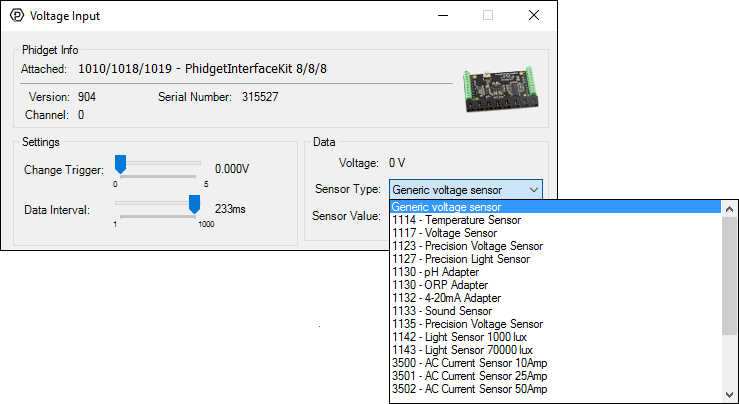 Select the 1133 from the Sensor Type drop-down menu. 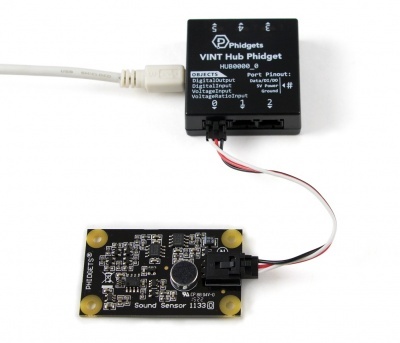 The example will now convert the voltage into sound pressure level (dB) automatically. 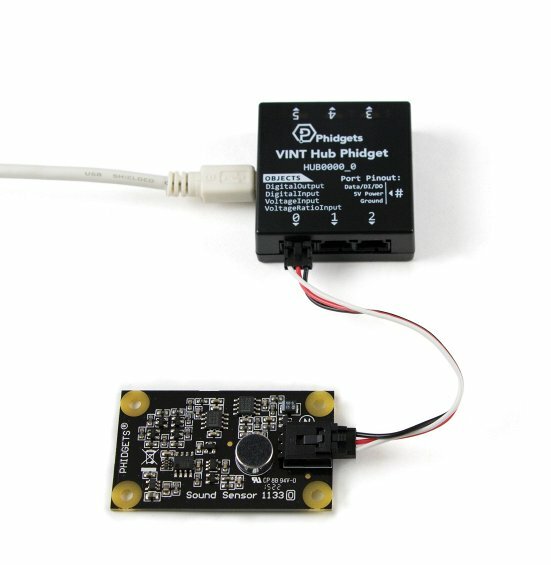 Converting the voltage to sound pressure level (dB) is not specific to this example, it is handled by the Phidget libraries, with functions you have access to when you begin developing! Sound pressure level (SPL) is measured in dB. The 1133 measures sound across a very wide range, with a frequency range of 100Hz to 8kHz and pressure level from 50dB to 100dB. The formula reports SPL , but the sensor is not sophisticated enough to be used as a substitute for a professional SPL Meter. Where SPL is the sound pressure level due to a 1kHz tone in decibels. It is important to note that measuring SPL is very complex and depends on factors other than only the perceived volume. One of the major contributing factors is the frequency of the sound source. Different frequencies of a sine wave with identical amplitudes will generate very different sound pressure levels. Other factors can be the distance between the sound source and the microphone, and even the type of sound source, such as speakers. The bandpass filter of any speaker can affect the output gain at certain frequencies without any change in the volume knob of the speaker. Electrical noise in the power supplied to the sensor can affect the output. 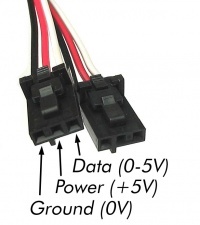 If the power supply is very noisy, this will introduce an offset in the output. 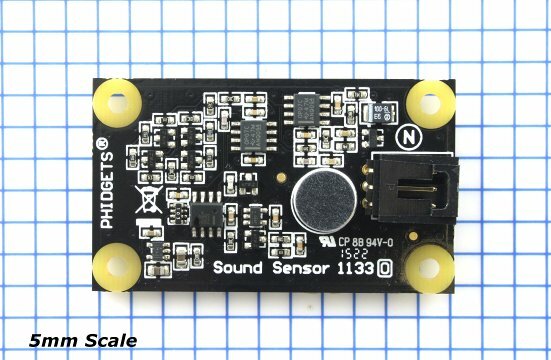 It is much more noticeable when trying to measure smaller sound pressure levels due to the very small voltages of the microphone being affected much more. As a result, the previous formula is only accurate for a 1kHz pure tone. At other frequencies, there can be up to an 8dB difference between the calculated SPL and the output of a calibrated Sound Pressure Level meter. The following graph is the response of the 1133 to a 1kHz beep. The beep lasts 75ms. The 1133 has a response time of 1.40ms when placed 30 cm (11.9 inches) from the sound source. The output from the 1133 reduces to normal over the next 80ms. 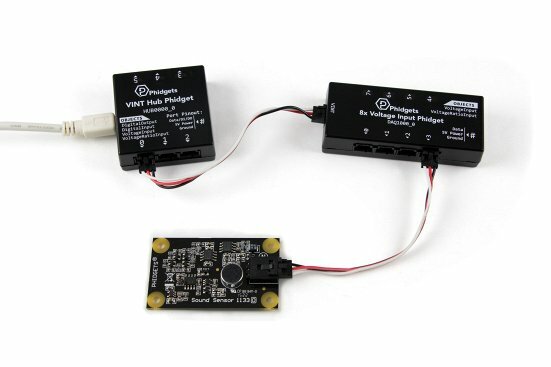 The voltage output of the sensor can vary by up to 0.1V in a pressure-stable environment. This is especially noticeable at lower output voltages. The best way to deal with this is to average a handful of reported values.